A pro-level system with the performance and features you need. 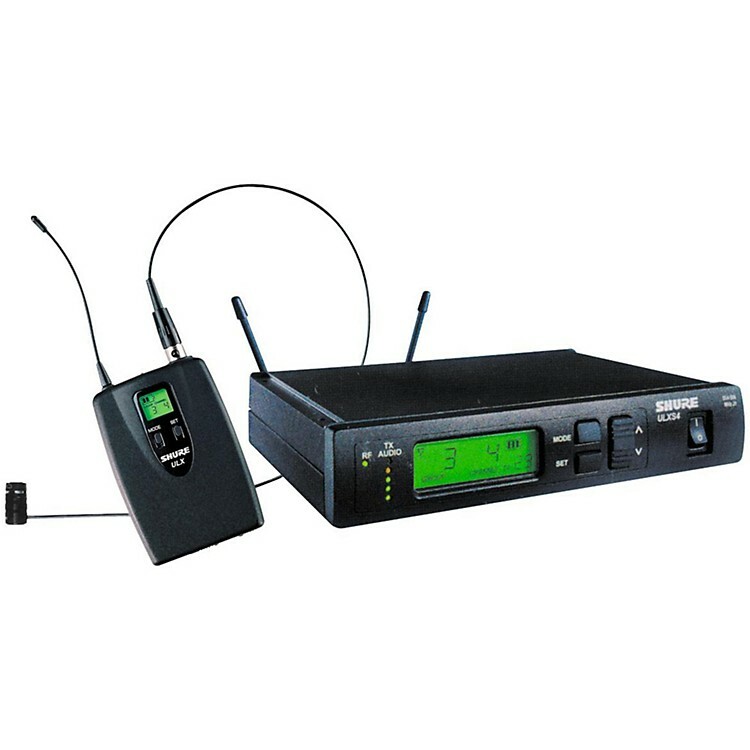 The Shure ULXS14/85 Standard Wireless Microphone System includes WL185 Supercardioid Lavalier Microphone, ULX1 Bodypack Transmitter, and ULXS4 Diversity Receiver. The WL185 Lavalier electret condenser mic was designed for use with a wireless body-pack transmitter. It has a 1.2 meter (4 ft.) cable terminated with a miniature 4-pin mini connector. Included tie clip can be rotated in 90 degree intervals for placement flexibility. The low-profile, highly durable body-pack ULX1 has all the characteristics to meet the demands of high performance. For use with headworn, Lavalier and instrument microphones, as well as guitars and basses. Attaches to belt, waistband or guitar strap with clip for hands-free mobility. The Shure ULXS4 Standard receiver offers an exceptional value in both performance and price, for both working musicians and sound installers. The feature set of the versatile ULXS4 receiver offers a direct path to full, clear audio signals, unencumbered and unattached. Enjoy wireless at its best. Order today. NOTE: Overall system frequency response depends on the microphone element. Modulation: ±38 kHz deviation compressor-expander system with pre- and de-emphasis. Operating Temperature Range: - 20 degrees to 49 degrees C (- 4 degrees to 120 degrees F) NOTE: Battery characteristics may limit this range. Polarity: Positive pressure on diaphragm produces positive voltage on pins 3 and 4 relative to pin 1. Power Requirements: Regulated nominal +5 Vdc (1.5 Vdc to 10 Vdc) provided at microphone connector pin 2 relative to pin 1 of a Shure wireless microphone transmitter. Net Weight: 0.7 oz. (21 g) with cable and connector.